A focus of ASMEX (the Australian Superyacht and Marine Export Conference) is to attract key international delegates who are interested in doing business with Australian companies. AIMEX as the organisers of ASMEX have delivered on this promise. MaryAnne Edwards AIMEX CEO announced today that in a partnership with the Gold Coast City Council they are bringing in some key global distributors and agents all of whom have a focus on the Australian Market. AIMEX announced today they have buyers from Brazil, Florida, UAE and Taiwan, specifically coming to the conference and show to network with Australian companies and to look at the capability of the industry on the Gold Coast and those attending the conference and exhibiting at Sanctuary Cove International Boat Show. 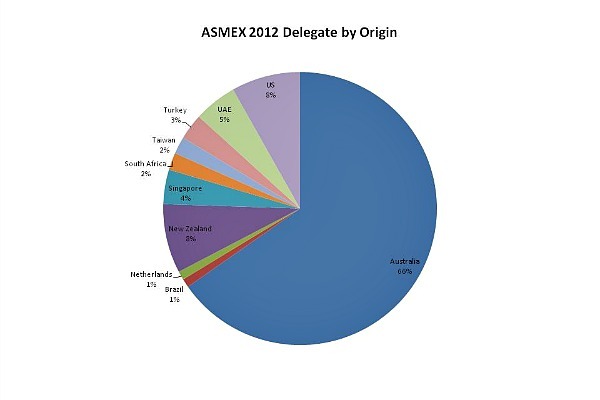 ASMEX delegates have registered from far and wide as demonstrated below offering an incredibly diverse network of attendees. MaryAnne Edwards said “we are always looking for relevant and productive ways to drive business for our members in the marine export and Superyacht sectors. What better way to do this than bring in key players in the market from around the globe.” Stakeholders coming in have also advised they are interested in looking at Australian made boats as well as key products. The line-up of speakers at the conference is nothing short of impressive and will certainly provide the industry with some key insights into the global market and what opportunities exist for Australian companies. So much business these days is word of mouth and with most businesses cutting their marketing budgets drastically many AIMEX and Superyacht Australia members see the conference as a cost effective way to drive their brand and capability. The networking opportunities at the conference and in the International Business lounge operated by AIMEX are significant and have a reputation for making excellent business connections. Edwards reiterated “If companies in the marine sector want to make connections and meet global buyers they need to be at ASMEX. Where else would you get such key stakeholders in one room. This initiative follows on from the media mission organised by AIMEX early last year when they brought in 6 International journalists to showcase Australian capability.